In just six hours on Sunday morning three separate incidents showed just one aspect of the vast negative impacts driving has on our state. Traffic safety issues are often framed in a way that makes them seem like it’s all about “bicyclists and pedestrians”. But the reality is that dangerous driving (and driving itself, but that’s another conversation) is a menace to everyone and no person — or thing — is safe as long as our roads and culture normalize this behavior. Linn County Undersheriff Jim Yon reports on March 26, 2017, at 02:49 a.m. Deputies responded to 3725 SE Spicer Road, Albany, for a reported crash of a vehicle into a house. The investigation revealed a white 2015 Subaru WRX 4-door sedan, was northbound on Three Lakes Road when it failed to negotiate a curve in the road where it intersects with Spicer Road. The vehicle left the roadway, crashing through a yard, into a power pole and then struck the front of a house before coming to a stop. The operator, Joshua Pairan 33-yrs-old of Albany, told deputies he was out for a drive to show his friends his new car. The passengers were identified as Noah Padilla, 33-yrs-old, and his wife Danielle Padilla, 31-yrs-old both from Albany. Danielle Padilla was sitting in the rear seat of the car and had to be rescued by the Albany Fire Department using the jaws-of-life to extricate her from the crushed vehicle. Danielle Padilla was transported by ambulance to Good Samaritan Hospital in Corvallis for non-life threatening injures. Joshua Pairan was arrested and charged with DUII, Reckless Endangering, Reckless Driving, Criminal Mischief II and Assault III. He was lodged at the Linn County Jail. Alcohol and excessive speed appear to be contributing factors to the crash. 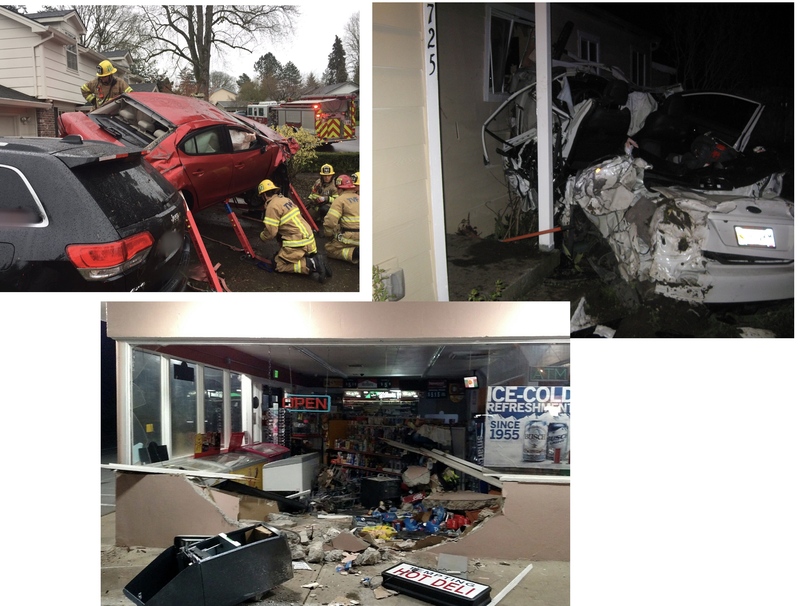 On March 26th, 2017 at about 3:00 am, a black Ford F150 intentionally crashes into the side of the building of the Star Market at 9005 River Rd NE and steals the ATM. The vehicle is described as a 2004-2006 year and having a leveling kit, running boards, black fender flares and black rims. The rear of the vehicle now has damage from ramming the building, twice. After the described suspect vehicle crashed into the building and left another subject entered into the business and stole several packs of cigarettes. His photo’s are attached. It is unknown if they two incidents are connected with each other. A car landed on top of a boat Sunday morning after a driver crashed in a Northwest Portland neighborhood, Tualatin Valley Fire & Rescue said. Fire crews rushed to stabilize the car so paramedics could start treating the injured driver. No word on that person’s current condition. The boat’s owner, Tim Brown, was home doing the dishes when he saw the car coming towards his house. “Catapulted across the street, landed on our driveway and bounced up on the vehicles,” Brown said. Brown says he’s had a car totalled before, after a previous incident where a car crashed in to his driveway. He didn’t have much time to be surprised by what happened Sunday morning. After seeing what had happened, he had his wife call 911, then Brown jumped in to action. “I had just taken an EMR class. Fortunately it was still fresh in my mind,” Brown said. “I grabbed my bag, I jumped on top and tried to make contact with the person in the vehicle.” Witnesses said the driver lost control, drove up a berm and traveled through some trees before landing on the boat. Emergency responders at the scene said it’s possible the driver suffered some sort of medical issue before the crash. People failing to control their cars and/or purposefully using them to create havoc are more common than you think — and this goes far beyond simply a “bike and pedestrian safety” issue. The post Oregon has a driving problem and we all need protection appeared first on BikePortland.org. Owner of RecumbentPDX says the stolen trike is one of only 12 or so on the entire west coast. An rare electric-assist recumbent trike was stolen in downtown Portland over the weekend. It belongs to someone who is physically disabled. Mel Birgé, owner of RecumbentPDX in southeast Portland, is offering $500 for its return. An HP Scorpion Plus Pedelec was stolen. It looks virtually-identical to the one in the attached picture (the stolen one is tan color and has a larger 26” wheel in the rear). 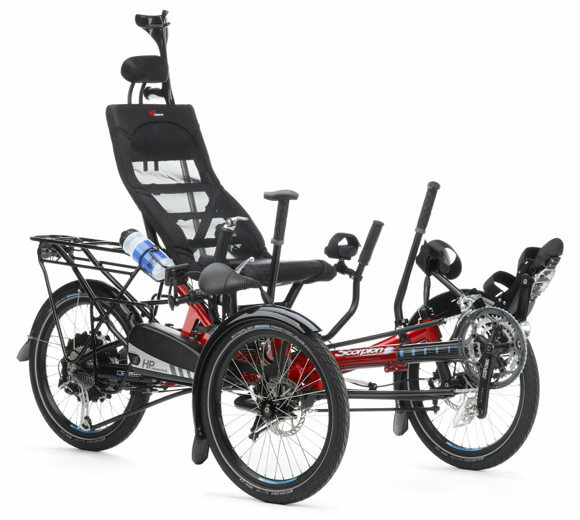 The trike has a Go SwissDrive electric motor in the rear wheel. The owner is disabled by a brain tumor and this is his primary recreation. This is a rare trike – likely aren’t more than a dozen on the entire west coast and it’s easily recognized. Mel has filed a police report. If you have seen this bike or know anything about its theft, please contact the police non-emergency line at (503) 823-3333 or contact us and we’ll connect you. The post Bike shop offers $500 reward for return of rare, stolen e-trike appeared first on BikePortland.org. Esplanade closes, bridge opens (for now). There have been updates to two stories we’ve been following over the weekend. After over 45 days of closure TriMet has found a “temporary fix” for the Lafayette Bridge elevator in the Brooklyn neighborhood. The bridge closed in February due to an issue with moisture in the system that caused the braking mechanism to fail. Last week TriMet said they still hadn’t figured out a solution. On Friday evening we finally heard from them that the elevator is working once again. TriMet has made a temporary fix and restored elevator service at the Rhine-Lafayette Pedestrian Bridge in Southeast Portland. While the elevators have been turned back on, there may be future disruptions as crews work to determine the root cause of a moisture issue that has led the safety systems in the elevators to activate and automatically shut down service at times. Our crews are trying some temporary solutions to prevent the water intrusion, until the cause of the issue can be confirmed. We apologize for the inconvenience and thank users for their continued patience as we work on a permanent solution. And in case you missed it (we always Tweet stuff like this, so you should follow us! ), on Saturday the Portland Parks and Recreation bureau closed the floating portion of the Eastbank Esplanade path between the Steel and Burnside Bridges. Snowmelt and rain have combined for high water levels on the Willamette, causing the floating docks to raise above the ramps that feed them. The closure will remain until the water level recedes to below 17.5 feet (check current levels here). Portland Parks & Recreation (PP&R) is temporarily closing the floating portion of the Eastbank Esplanade due to extremely high Willamette River water levels. PP&R has been carefully monitoring this section of the popular riverside trail, located on the east side of the Willamette, over the past few days. During periods of very high water, when the river reaches approximately 17.5 feet, the ramps rise to an angle determined to be potentially unsafe for people on bikes, on foot, and for those using mobility devices. This situation has occurred in the past during rare, extremely high river elevations (most recently in May of 2011). The floating section of the Esplanade is tethered to the solid riverbank between the Steel Bridge to the north and past the Burnside Bridge to the south. Staff are installing warning signs (attached) to notify cyclists, runners and walkers. Signs will be located on the Esplanade, both ahead of the impacted areas and at the points of closure. The closure will remain in effect for an undetermined length of time – until river conditions allow for safe travel on the impacted section of walkway. Staff are monitoring conditions regularly and will reopen the area as soon as it is determined to be safe. Commuters, walkers, cyclists, etc., should use street alternatives. With our crazy winter weather and approaching spring/summer construction season, you can expect a lot of construction detours and closures in the months ahead. We’ll keep you posted as we can — and please contact us if you come across anything we should know about. The post Updates: Portion of Esplanade path closes, Lafayette Bridge elevator back online (for now) appeared first on BikePortland.org. This week’s Monday Roundup is sponsored by The eBike Store, Portland’s exclusive dealer of the BuddyRider dog carrier. The NYPD strikes again: Seems like every time I check my news feed there’s another example of how police in New York City just don’t get it. This time they’ve confiscated hundreds of “illegal” e-bikes used by the city’s droves of food delivery workers. WTH? Holier-than-thou: A religious leader in Boston has found what many biking veterans have — a deeper spirituality and stronger connection to place — since she started biking to church. She’s even written a book about it. Portland loves auto parking: The DJC has a good roundup of all the auto parking projects the City of Portland and Portland Development Commission are poised to spend millions on this year. Bike share revolution in China: Beijing, once a bicycle capital of the world, was overrun with cars in recent decades. Now bikes are coming back thanks to high-tech bike share systems. Ofo leading the charge: Ever hear of Ofo? It’s a Chinese bike-sharing company that’s valued at over a billion dollars and just got a visit from Apple CEO Tim Cook. Studying scofflaws: A major study found that people generally break traffic laws while cycling just to stay alive — not to be jerks. Trump’s budget and bikes: The League of American Bicyclists breaks it down. It’s not all bad, but it’s pretty bad. Let’s hope this thing goes the way of his health care plan. 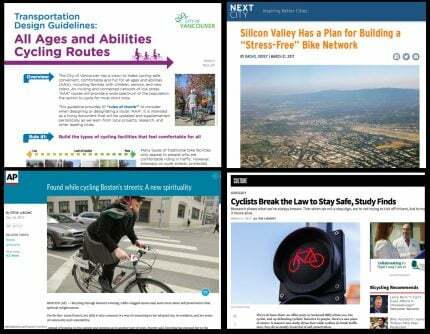 Silicon Valley’s bike vision: Some heavy-hitters in the tech world are behind a new vision for better bicycling in the Silicon Valley. It’ll take more than a vision: A report by the Silicon Valley Bicycle Coalition found that people won’t try cycling because they feel auto users drive too dangerously. World-class fast: USA Cycling (America’s governing body of racing) wants to be the best in the world — with a focus on their women’s teams and BMX. Not that AAA: Vancouver, Canada has just released an inspiring new set of bicycle facility design guidelines that put the focus squarely on “All ages and abilities” or AAA. Bikeway debate in NZ: Small market owners in New Zealand blame a bikeway for the demise of their business because it took away auto parking. Take risks: Los Angeles DOT leader Seleta Reynolds is a breath of fresh air in the transportation reform world. They’re loud too: Cars: They pollute our air, they are used as weapons by terrorists, they turn people into assholes, they kill 40,000+ people every year, they take up way too much space in our cities and towns — and they also make too much damn noise. The post The Monday Roundup: Holy spokes, scofflaw study, N-why-PD?, and more appeared first on BikePortland.org.